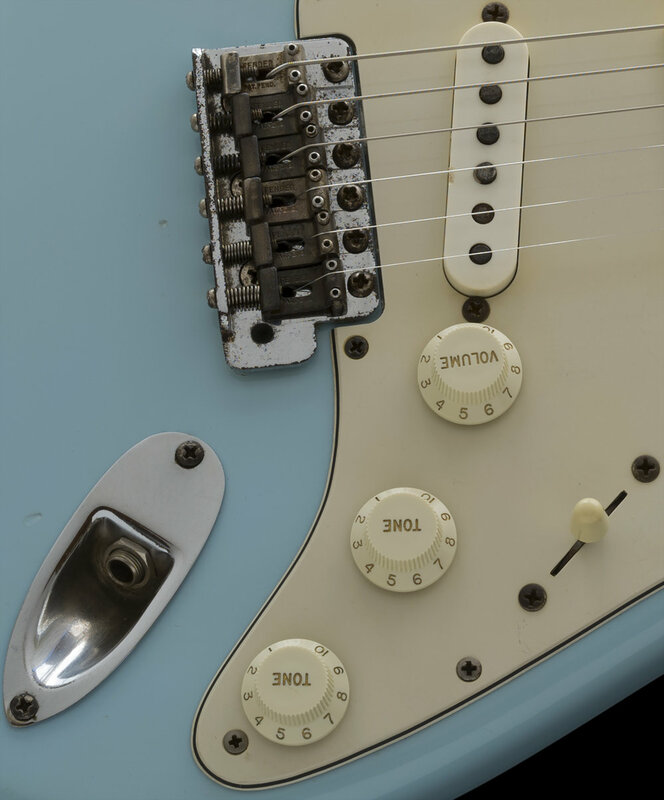 This Pre-CBS Stratocaster that was repainted and setup to play and enjoy. 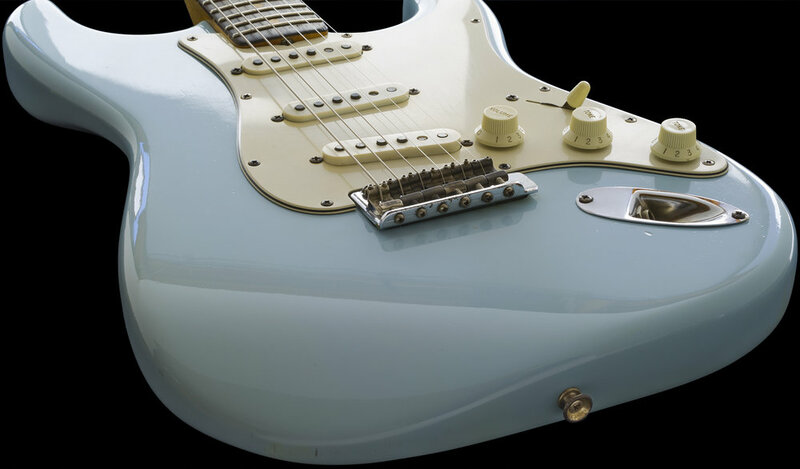 The most important parts of the guitar are correct and original, those being the body, neck, pickups, tremolo bridge and tuners. The Brazilian rosewood fingerboard has a gorgeous, deep and luscious chocolate brown hue. The Plastic parts are Reissues from over 20 years ago. The Pickup selector switch is a 5-way unit. The Original bridge has been serviced by me and is fully working, each and every screw turns and it is fully adjustable. I have examined, tested, serviced and set-up this instrument. The Sonic Blue paint work is quite old now and very nice. The body shape looks very good and has not been over sanded or re-contoured in any way and the paint and clear top coat finishes were thinly applied. 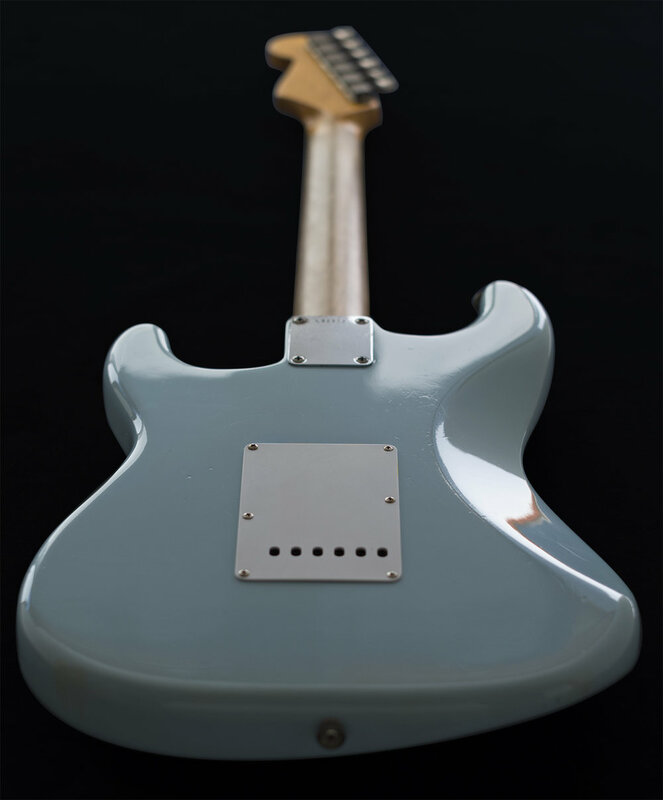 The Neck has a naturally worn-in look and smooth feel and the remaining Lacquer finish is original and factory applied, however, the Logo has been replaced, most likely back when the guitar was repainted. The frets are tall and healthy due to an older professional re-fret. 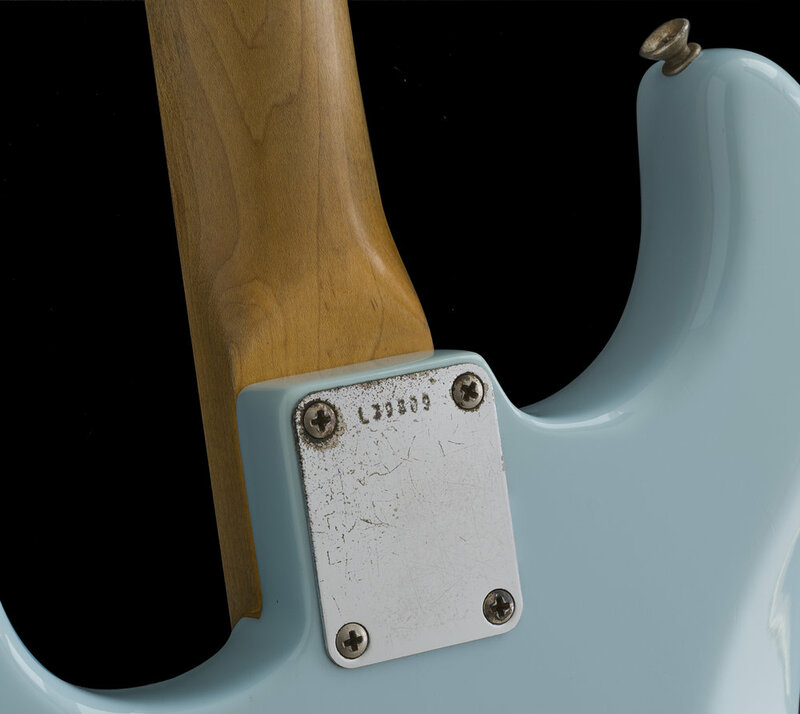 In addition to the natural vintage patina, the neck shows normal signs of wear and use, not surprising since the guitar is over 50 years old and has been played. 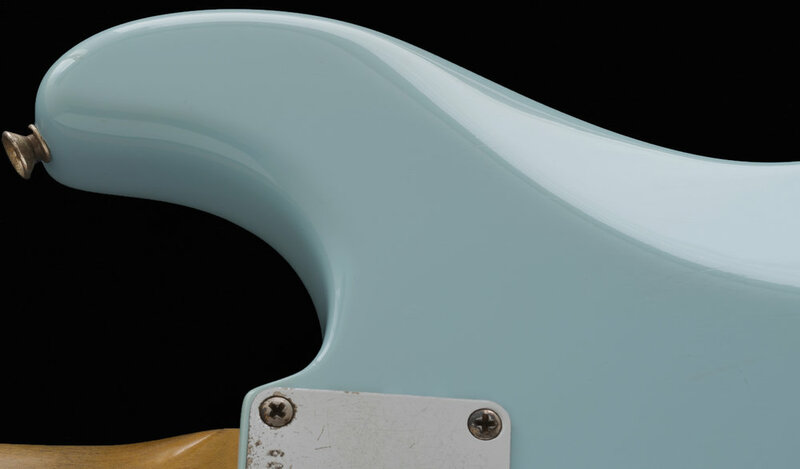 The pickguard and the pickup covers are light mint green vintage "reproductions". The Gray bobbin pickups are original coils and all are 3 are matched and dated 1964. 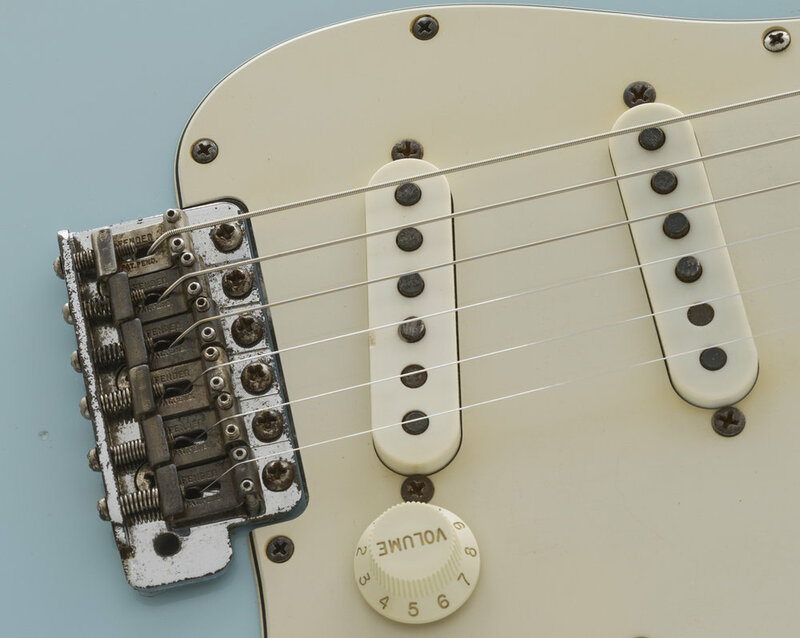 One of them is Yellow Ink date-stamped and 2 dates are hand dated, which is normal as 1964 is a transitional period for pickup changes as well as many other Fender features. 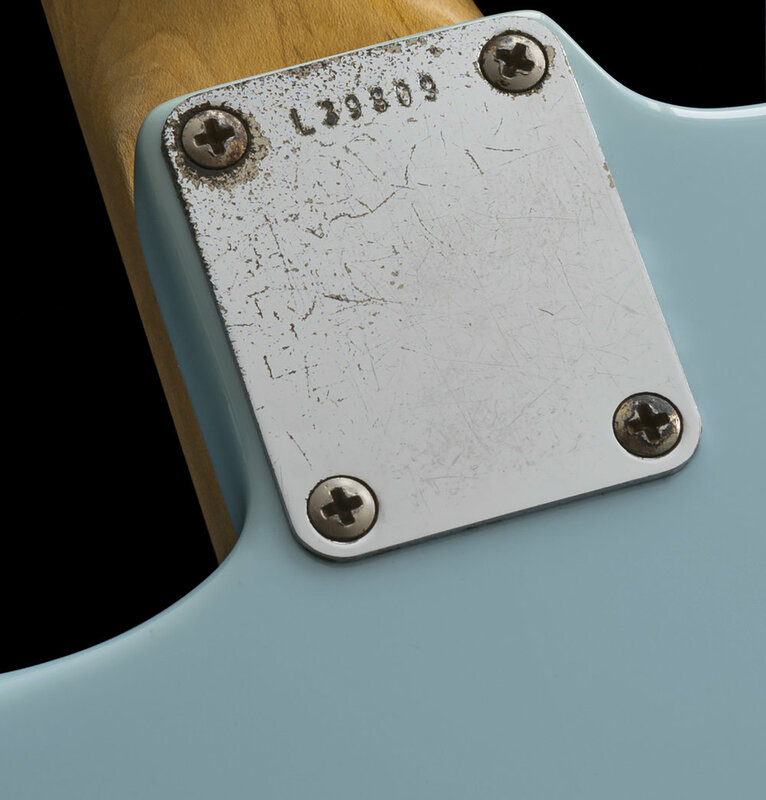 Beginning in 1964, the pickups were commonly black bobbin units with a yellow inked-on date stamp, but that particular dating practice was a short-lived production technique at Fender, so seeing a gray bobbin with the Yellow date stamp is a "transitional" and uncommon feature and the other 2 gray bobbin dates are "hand-written" as was the manufacturing process from late 1964 forward until they began date "stamping" them again in the late 60's. The 3 potentiometers are dated 1981 and not original. The Neck is correctly dated and stamped "2 AUG 64 B". The CASE is not original to the guitar but is a mid-1960's Fender black Tolex case and it is in excellent condition with a functioning handle, latches, and hinges. 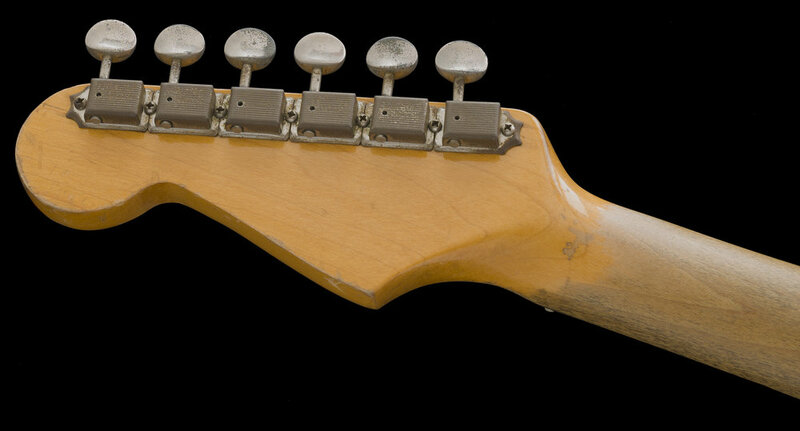 This guitar is now 54 years old. I acquired it over 20 years ago while running my store. 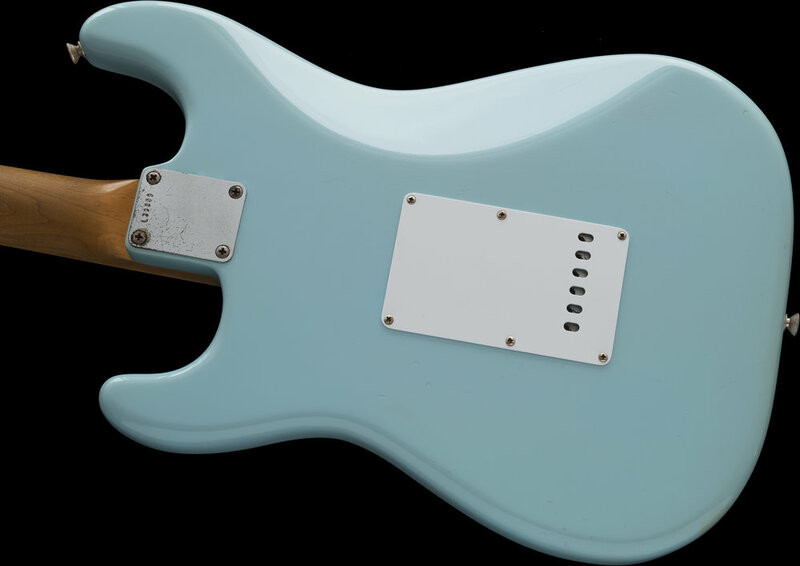 Even back then, finding an original Sonic Blue Pre-CBS Strat was not easy, and even though I had some original examples saved, I felt some affinity for this guitar and kept it. I liked it then and I still like it today. I have recently sat and played this guitar at length and have fondly rediscovered its wonderful vintage virtues. 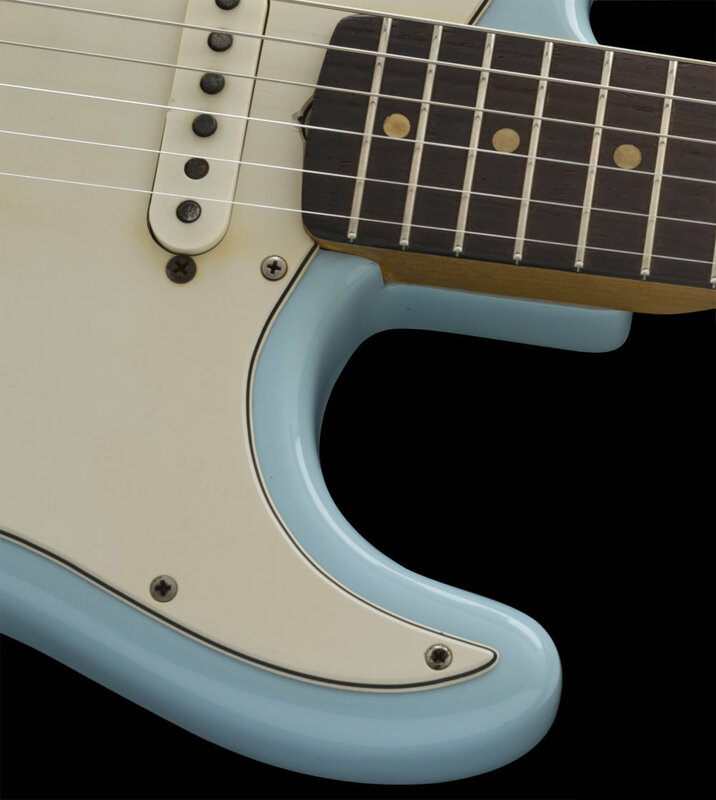 Not only does it have a great look and vibe in addition to being set up to use and enjoy, I hear a deep, rich and clear tonality when I play it, it's what I expect from an old rosewood neck Strat, but as we all have a different touch and approach, your results may vary and only YOU can really decide if it's a sound you like or consider good. 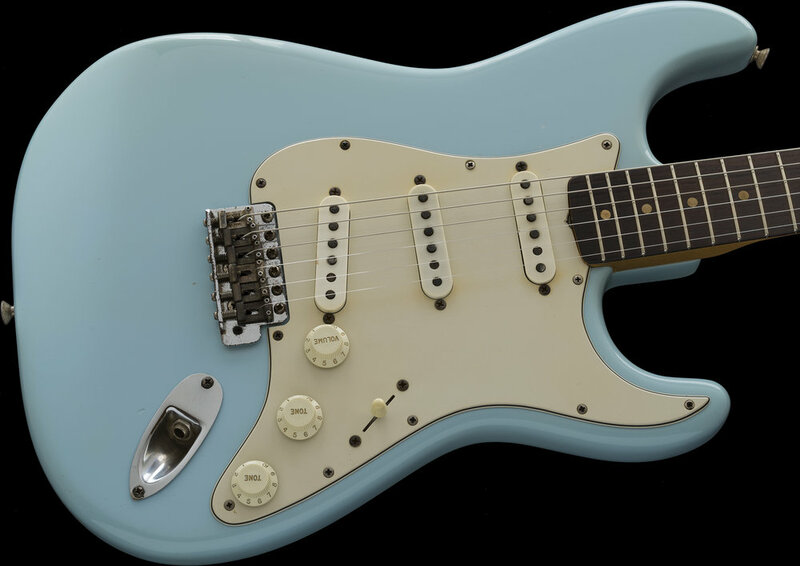 If you desire having an affordable vintage Stratocaster in your stable, I'd highly recommend trying this vintage players condition guitar. If you have any question or interest, kindly inquire.